Going up this route is a challenge: rough underfoot, an overgrown track more used by elephants than humans, muddy when wet, no huts and with dense stands of giant bamboo and montane forest -why would you want to take it? Well it’s for real wilderness aficionados. The route was pioneered during colonial days and then abandoned for many years until it was re-opened in the early 90’s. It provides a unique and completely natural mountain trekking experience. Up to point lenana then descend on the chogoria route provides the most spectacular views and completes a traverse of Mount Kenya. 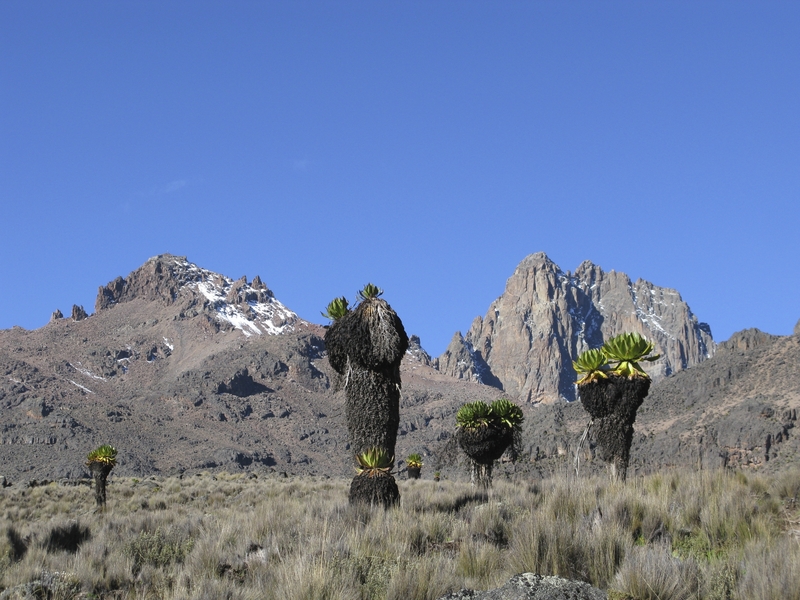 Gentle hike down a broad ridge enjoying magnificent views back up the valley to the Mt Kenya snowy peaks, and down to waterfalls, tarns and lava flows in the Gorges Valley itself. 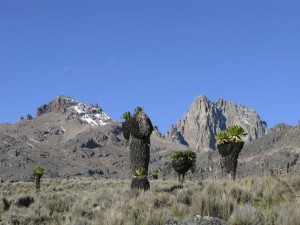 Overnight in the Meru Mt. Kenya cabins – log fires, hot showers, beds – and if the supply vehicles have made it up through the forest, Tusker beers! Wildlife viewing possible in evening with elephant and buffalo often grazing outside our cabins and a large numbers of forest and moorland birds. Transfer from Nairobi to Nanyuki for lunch. After lunch drive to Gathiuru forest station and a 4 hour ascent through dense stands of towering bamboo to a Giant Bamboo Camp at 2600m. Elephant and buffalo are common here. Spectacular scenery as the jagged volcanic peaks and shimmering glaciers tower above our trek around the summit circuit. Turquoise tarns nestle in the valleys, eagles and buzzards soar overhead – it’s difficult to believe we’re on the equator! We might, for the first time, meet other trekkers here as we hike for 5-6 hours to overnight at Shipton Camp at 4,200m. Predawn start for the summit attempt. Up steep screes and a bare rocky track to reach the summit. It’s an exhilarating 3 hours from here to reach the hiker’s summit, Pt Lenana at 4,985m in time for the sunrise – Kilimanjaro is usually visible 340kms to the south then 2-3 hours descent to Hall Tarns (4,300m), where we have a hefty breakfast and spend the day here to rest and to relax. Our campsite is perched close (but not too close) to the top of a sheer 300m cliff overlooking the Gorges Valley. Gentle hike down a broad ridge enjoying magnificent views back up the valley to the snowy peaks, and down to waterfalls, tarns and lava flows in the Gorges Valley itself. Overnight in the Meru Mt. Kenya cabins – log fires, hot showers, beds – and if the supply vehicles have made it up through the forest, Tusker beers! Wildlife viewing possible in evening with elephant and buffalo often grazing outside our cabins and a large numbers of forest and moorland birds. Three hours walk down through the bamboo forest to meet our vehicles for the return journey to Nairobi, arriving in the late afternoon. Prices are per person in US Dollars and based on group size. All food while on the Mountain. Porter support for the climb. Thank you so much for organising one of the best experiences of my life! I had the most amazing time in the mountain. A big thanks for making our trip so successful. Your team were amazing, supportive and very professional and treated us with such respect!. We had the best trip earlier this year. We booked up through GotoMountKenya - Evans was our correspondent, and he is absolutely reliable, and wonderful! He organised everything for us on Mt Kenya, and then took us to Tanzania for our Mt Kilimanjaro adventure. I had a fantastic time on the mountain and enjoyed every step. Zachary and Chris did an outstanding job and were very professional. I am hopeful that they enjoyed my company as much as I enjoyed theirs. We had the best trip earlier this year. We booked up through GotoMountKenya – Evans was our correspondent, and he is absolutely reliable, and wonderful! He organised everything for us on Mt Kenya, and then took us to Tanzania for our Mt Kilimanjaro adventure. A big thanks for making our Mt Kenya trip so successful. Your team were amazing, supportive and very professional and treated us with such respect!. .